What levels of estimated GFR are alarming? How to deal with chronic kidney disease? This GFR calculator (estimated glomerular filtration rate calculator) is a tool that can help you with detecting a kidney disease at its early stage. Read on to get a better understanding of how it works, how to calculate the GFR from creatinine and cystatin C levels and what values of estimated GFR (eGFR) are an alarming indicator. Estimated glomerular filtration rate, or eGFR for short, is a parameter that determines the risk of kidney disease. It can be calculated from your blood test results. If the result is low, it may indicate that your kidneys don't function correctly; in the worst case, you might have chronic kidney disease. The faster it is diagnosed, the better are the chances for an effective treatment. The unit of GFR is mL/min/1.73m². The value 1.73m² is the standarized body area - that's why none of the equations include a variable of height or weight. There are four main equations that you can use to estimate GFR according to the National Institute of Diabetes and Digestive and Kidney Diseases. Our glomerular filtration rate calculator uses all four of them, so that you can compare all results and see whether all of them are in the normal range. Note that the GFR calculator is suitable only for adults aged 19 or older. Use the pediatric GFR calculator to calculate the glomerular filtration rate of children. This is the basic and most recommended method. It uses just one blood test result, for serum creatinine. SCr is the level of standarized serum creatinine in mg/dL. It's a version of the previous formula that also takes into account the level of serum cystatin C. It provides more accurate results for patients with unusual diet or extreme muscle mass. Scys is the level of standarized serum cystatin C in mg/L. This equation takes into consideration only the level of serum cystatin C. It is a useful formula for patients with unstable creatinine concentration (for example pregnant women), as well as a confirmatory test after applying the previous two equations. This is an alternative to the CKD-EPI equations composed by the Chronic Kidney Disease Epidemiology Collaboration. The MDRD equation stands for Modification of Diet in Renal Disease; it has been proven correct for patients between 18 and 70 years old and returns correct values for all patients with common causes of kidney disease. Now that you know how to calculate the GFR (and have used our GFR calculator to find out yours), you probably wonder what do the results mean. The list below shows the typical values of GFR on different stages of kidney malfunction, basing on the data presented by the National Kidney Foundation. Even if your eGFR is mildly decreased (to 60-80), it still does not necessarily mean you are in danger of kidney malfunction. First of all, the level of GFR decreases with age; the normal GFR of people aged 70 or older is only 75. Moreover, you should monitor the levels of creatinine and cystatin C to check whether this lowering of GFR is a long-term condition. Only if the estimated glomerular filtration rate is below 60 for 3 months straight (or if you have other worrying symptoms, including high levels of albumin in your urine), it means that you may have chronic kidney disease (CKD). Make sure to pay your doctor a visit! He may suggest further tests, such as a simple urine test or kidney biopsy. If you have some of the symptoms of CKD - lowered GFR or worrying markers in your urine occurring for longer than 3 months - you may have the chronic kidney disease. In 2 out of 3 cases, it is caused by diabetes or high blood pressure. The other common causes of CKD are immunological or inherited diseases. If your CKD was diagnosed at an early stage, you're lucky - it can be slowed down or brought to a complete stop. With proper monitoring, it is possible that you will never experience major kidney problems. If, on the other hand, your kidneys are in a really alarming state (at the end stage of kidney disease), you may require a dialysis or a kidney transplant. 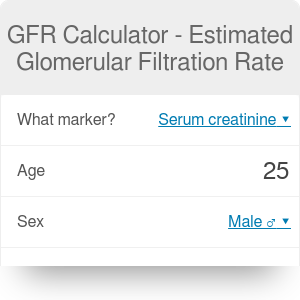 GFR Calculator - Glomerular Filtration Rate can be embedded on your website to enrich the content you wrote and make it easier for your visitors to understand your message.